Told from the viewpoints of six main characters—Ziggy, Mickey, Phil, Nancy, Cheryl, and Don—Purple Daze gives the reader a dynamic experience of both the social and political ups and downs of a critical time in history. Not being your average historical fiction novel, Purple Daze is a combination of letters, journal entries, notes, and newspaper clippings jaggedly put together in free verse to express a timeline of war, relationships, political movements, and rock ’n’ roll. Although sometimes hard to follow along, this story provides an insight into the mindset of teens during the year 1965, specifically into their exciting, sometimes funny, and always dramatic lives. Through life changing experiences like witnessing firsthand the Vietnam War, these six friends find themselves and discover the true meaning of friendship and sticking by what you believe in. Slammed by the consequences of their actions, whether with relationships, parents, partying, or high school, Ziggy, Mickey, Phil, Nancy, Cheryl, and Don eventually grow up and learn to make the right choices. Touching upon controversial issues during this time, Sherry Shahan effortlessly describes how the six teens deal with whatever hits them; yet despite the plethora of action, Ms. Shahan manages to develop and maintain the characters’ individual personalities and perspectives throughout the entire story. 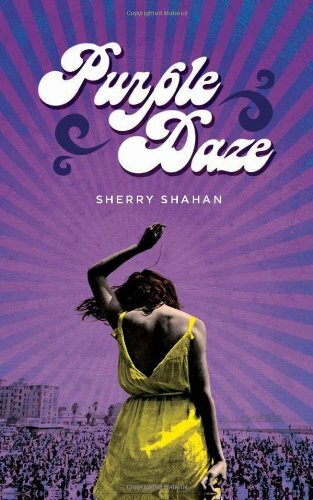 Eccentric yet tasteful, Purple Daze is uniquely and beautifully written, highlighting author Shahan’s one-of-a-kind writing style and technique. Whether the reader is looking for a blast from the past purposefully executed, or a rollercoaster ride of a novel, Purple Daze is sure to please both young adult and adult audiences.